The R-value is a modern fairy tale. It is a fairy tale that has been so touted to the American customer that it now has chiseled in-stone status. But the saddest part of this fairy tale is that the R-value by itself is almost a worthless number. Consider the R-value of an insulation after it has been submersed in water as a 20 mile-per-hour wind blows through it. 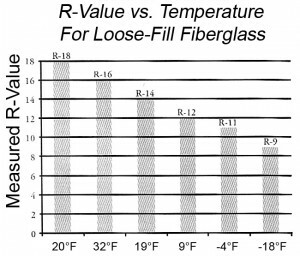 In either of these scenarios, the R-vlaue of fiber insulations goes to zero. But those same conditions barely affect solid insulations. That’s why I believe that R-value numbers are misleading, meaningless numbers unless we know other characteristics. In all probability, no one would ever buy a piece of property knowing only one of its dimensions. Suppose someone offered a property for $100,000 dollars and told you it was a seven. You would instantly wonder what that number referred to: Seven acres? Seven square feet? Seven square miles? What? You would also want to know the property’s location: In a swamp? On a mountain? In downtown Dallas? In other words, one number cannot accurately describe anything, and that includes the value of insulation. Nevertheless we have Code bodies mandating R-values of 20s or 30s or 40s. But a fiber insulation with and R-value of 25 places in an improperly sealed house will allow wind to blow through it as if there were no insulation. Maybe the R-value is accurate when the material is lab tested. But a lab environment may not ever remotely duplicate conditions in the real world. Consequently, we must start asking for some additional dimensions for our insulation. We need to know its resistance to air penetration, to free water, and to vapor drive. We must begin demanding the R-value of an insulating material after it is subjected to real world conditions. The test used to produce the k-value is an ASTM (American Society for Testing Materials) test. 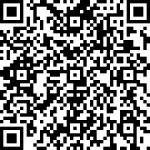 This ASTM test was designed by a committee to give us measurement values that — they hoped — would be meaningful. Unfortunately, the test was designed with a flaw or bias. Because of the way it’s designed, the test favors fiber insulations: fiberglass, rock wool and cellulose fiber. Very little input went into the test for solid insulations, such as foam glass, cork, expanded polystyrene or urethane foam. Nor does the test account for air movement (wind) or any amount of moisture (water vapor). In other words, the test used to create the R-value is a test in non-real-world conditions. 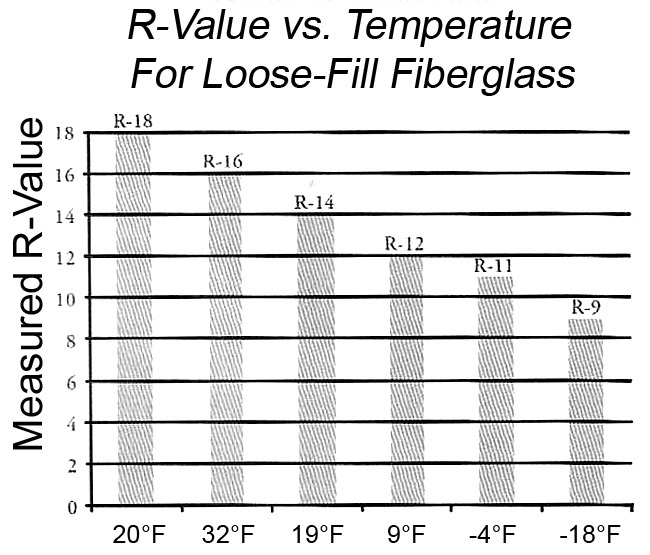 For instance, fiberglass is generally assigned an R-value of approximately 3.5. It will only achieve the R-value tested in an absolute zero wind and zero moisture environment. Zero wind and zero moisture are not real-world. Our houses leak air, all our buildings leak air, and they often leak water. Water vapor from the atmosphere, showers, cooking, breathing, etc. constantly moves back and forth through walls and ceilings. If an attic is not properly ventilated, water vapor from inside a house will very quickly semi-saturate the insulation above the ceilings. Even small amounts of moisture will cause a dramatic drop in a fiber insulation’s R-value — as much as 50 percent or more. We are told, with very good reason, that insulation should have a vapor barrier on the warm side. Which is the warm side of the wall of a house? Obviously, it changes from winter to summer — even from day to night. In a wintry 20 F below zero environment, the inside of an occupied house will certainly be the warm side. But during sun-shiny summer months, the outside will be the warm side. Sometimes a novice owner or builder will put vapor barriers on both sides of the insulation. Vapor barriers so placed generally prove to be disastrous. It seems the vapor barriers stop most of the moisture but not all. Consequently, small amounts of moisture move into the fiber insulation, between the two vapor barriers and become trapped. The moisture accumulates as the temperature swings back and forth. This accumulation can become a huge problem. It can eventually total buckets of water that saturate the fiberglass. We have re-insulated a number of potato storages that originally was insulated with fiberglass and a vapor barrier on both sides. Fiber insulation needs ventilation on one side; therefore, the vapor barrier should go on the side where it will do the most good. Most people know that air penetrates the walls of a house. In fact, when the wind blows across some homes, its tenants can feel it. But what most people, including many engineers, do not realize is that there are very serious convection currents rotate vast amounts of air, but they are not fast enough to feel or even measure, with any but the most sensitive instruments. Nevertheless, the air constantly carries heat from the underside of the fiber pile to the top side, letting it escape. If we seal off the air movement, we generally seal in water vapor. That additional water often condenses and can become a moisture-source that rots the structure. The water, as a vapor or condensation, seriously decreases an insulation value — the R-value. The only way to deal with a fiber insulation is to ventilate. But ventilating means moving air that also decreases R-value. The filter medium for most furnace filters is fiberglass — the same spun fiberglass used as insulation. Fiberglass is used for an air filter because it has less impedance to the air flow, and it is cheap. In other words, air flows through a furnace filter very readily. All well and good for a furnace filter — but can the same material effectively insulate a structure? Can you imagine insulating a house by stuffing furnace filters into the walls and ceiling? Tremendous air currents blow through the walls of a typical home. To demonstrate, hold a lit candle near an electrical outlet on an outside wall when the wind is blowing. That flame will flicker and may even go out. The average home with all its doors and windows closed has a combination of air leaks equal to the size of an open door. Even if we do a perfect job of installing fiber insulation in our house and bring the air infiltration close to zero from one side of the wall to the other, we still do not stop air from moving vertically through the insulation itself, in ceilings and walls. The best known solid insulation is expanded polystyrene. Other solid insulations include cork, foam glass, and polyisocyanate or polyisocyanurate board stock. That last two are variations of urethane foam. Each of these insulations is ideally suited for many uses. Foam glass has been used for years on hot and cold tanks, especially in places where vapor drive is a problem. Cork is of course a very old standby, often used in freezer applications. EPS or expanded polystyrene is seemingly used everywhere — from throw away drinking cups and food containers to perimeter foundation insulation, masonry insulation etc. Urethane board stock is becoming the standard for roof insulation, especially for hot mopped roofs. It is also widely used for exterior sheathing on many new houses. The R-value of the urethane board stock is of course better than any of the other solid insulations. All of these solid insulations perform far better than fiber insulations whenever there is wind or moisture involved. Spray-in-place polyurethane is the only commonly used solid insulation that absolutely protects itself from air infiltration. When it is properly placed between two studs or against a concrete block wall of wherever, the bonding of the spray plus the expansion of the material in place creates a total seal. It’s almost impossible to overestimate this total seal. In my opinion, most of the heat loss in the walls of a home has to do with the seal, rather than the insulation. Heat does not conduct horizontally nearly as well as it does vertically. Therefore, if a home has no insulation in its walls, but did have an absolute airtight seal, there would not necessarily be a huge difference in heat loss. But this would not be the case if ceiling insulation was missing. This next section covers aspects of insulation that most people are unfamiliar with or don’t know very well. There is a substantial difference between insulation for temperature control and insulation for heat loss control. 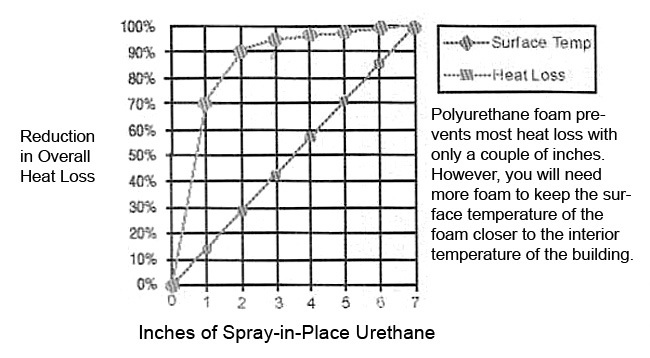 For instance, the graph shows the heat loss control of spray-in-place urethane foam insulation. Other insulations will have a similar graph but with thicker amounts of insulation. This graph points out that more insulation is not necessarily cost effective. 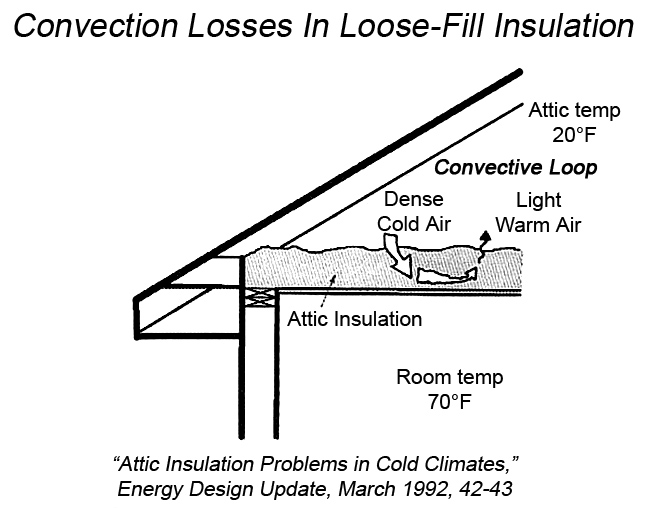 From a heat loss perspective, there is a point at which more insulation is pointless. This graph illustrates a building’s reduction in heat loss when it is insulated with various thicknesses of spray-in-place urethane foam. Note: Above 3 inches, the insulation benefit tops off quickly. The graph is not exact, but it shows, in general, what happens as additional insulation is added to the surface temperature. In other words, by super-insulating, the surface temperature of the inside of the exterior walls comes very close to the room temperature. This prevents condensation, that, in turn, prevents mold growth. The graph shows that 70% of heat loss from conductance is stopped by a one-inch thickness of spray-in-place urethane foam. Note: Nearly 100% of the heat loss from air infiltration is stopped with the first one-fourth of an inch of urethane foam. 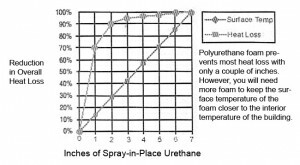 The second inch of spray-in-place urethane stops about 90% of heat loss, and the third in stops 95% and so forth. Here is a simple explanation for the way it works: As the temperature of the atmosphere cycles from cold to hot to cold the heat sink absorbs or gives up heat. But because the heat sink can absorb so much heat, it never catches up with the full range of the cycle. Therefore, the temperature of the heat sink tends to average. Large heat sinks will average over many days, weeks or even months. An adobe hacienda with its two-to-six-foot thick walls exemplifies this process. By the time the adobe walls begin to absorb the daytime hear, it is night time, and the same heat then escapes into the cooler night. Therefore the temperature averages. Because of the adobe’s larger mass, the temperature averages over periods of months. So, adobe acts as an insulation even though adobe has a minimal R-value. According to the graph, urethane thickness beyond four or five inches are practically immaterial. We use three inches for most of our construction. Two inches will do a very superior job. We have insulated many metal buildings with one inch of urethane and got a dramatic drop in heat loss. Obviously the first quarter inch takes care of wind blowing through cracks. (It usually takes an inch to be sure all the cracks are filled.) The balance of the inch adds the thermal protection. We had various customers ask us to insulate buildings with anywhere from two to five inches of urethane. But the building insulated with two inches would hold the temperature of the potatoes properly and just as well as the building with five inches. The difference came in the condensation. Potato storages are kept at very high humidity levels. So, buildings with two inches of urethane would have far more condensation than those with five inches. An engineer from the Upjohn company explained this to me. He stated that thicker insulation is absolutely necessary to maintain higher interior surface temperatures. One and a half inches of urethane on the walls and ceiling of a potato storage would control the heat loss from the buiding, but it took a minimum of three inches of urethane to control the interior surface temperature. Four inches was even better. With five inches the difference is practically negligible. The only place where we have felt the need for five inches of urethane was in insulating the roof or ceiling of a sub-zero freezer. Experience has taught me that R-value tables can be used as indicators, but they need modifications to make them equal to real world conditions. Allowances must be made. They must show equivalents. These equivalents should indicate that one inch of spray-in-place urethane equals four inches on fiberglass in normal installations. 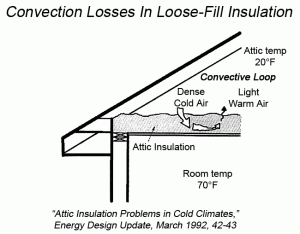 Footnotes to the table should define degradation of insulations in real world conditions. Only then will the R-value Fairy Tale become a real world success story.